Christine Wilson, Rebuilding Communities Inc. The multiple and diverse perspectives, skills, and experiences inherent in community–academic partnerships make them uniquely positioned to educate policy makers and advocate for health equity. Effective communication tools are critical to successfully engage in the policy-making process. Yet few resources emphasize the development and use of practical tools for translating community-based participatory research (CBPR) findings into action. The purpose of this article is to describe a CBPR process for developing and using a one-page summary, or “one-pager,” of research findings and their policy implications. This article draws on the experience of the Healthy Environments Partnership (HEP), a community–academic partnership in Detroit, Michigan. In addition to describing these processes, this article includes a template for a one-pager and an example of a one-pager that was written for and presented to federal policy makers. Izumi, B. T., Schulz, A. J., Israel, B. A., Reyes, A. G., Martin, J., Lichtenstein, R. L., ... & Sand, S. L. (2010). The one-pager: A practical policy advocacy tool for translating community-based participatory research into action. 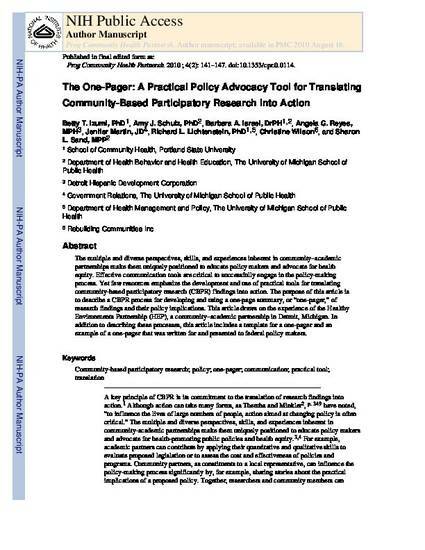 Progress in community health partnerships: research, education, and action, 4(2), 141.